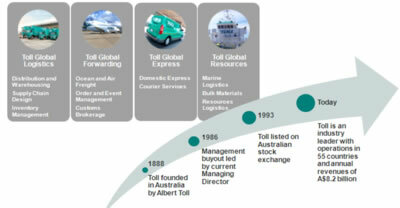 Toll is the Asian region's leading provider of integrated logistics services, generating annual consolidated revenue of AU$8.2 billion and operating an extensive network of over 1100+ sites throughout more than 50 countries across the world. Toll's access to transport and infrastructure assets includes road fleets, warehousing, ships, air freight capacity, ports and rail rolling stock. These assets when combined with operational expertise and technology solutions are aimed at driving supply chain efficiencies to deliver best practice in supply chain management for Toll's diverse customer base.